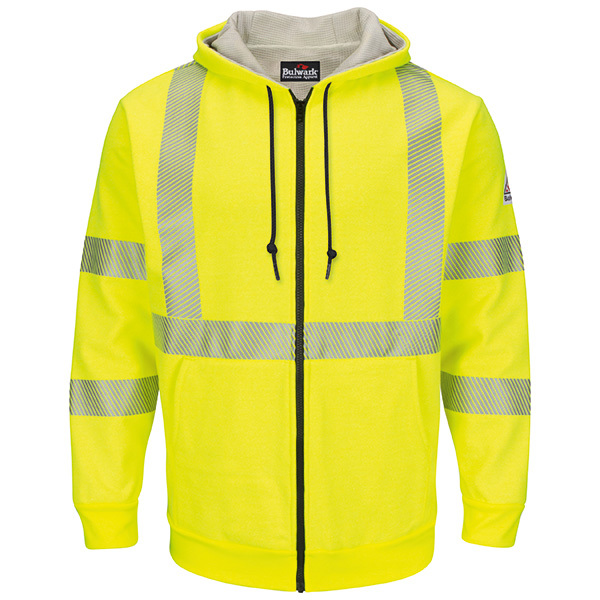 The SMZ4HV by Bulwark is hi vis FR, zip-up hooded fleece sweatshirt with waffle lining. Made with an FR fabric blend of 10.5oz Modacrylic, Cotton and Polyester, this sweatshirt has an Arc Rating ATPV 35 cal/cm. The waffle knit lining is made with Modacrylic and cotton and will provide addtional comfort and warmth. 2" FR heat seal silver reflective striping provides 360� visibility on the front and back, meeting ANSI 107-2015 Type R Class 3 compliance. The hood is double-ply and can be fastened with drawstring closure. 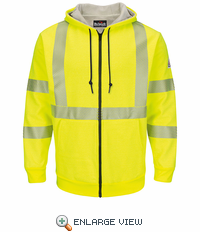 Front closure is secured with a full length zipper and seperates two hand warmer pockets, that also conceal a small pocket on the right front. �Flame Resistant 10.5oz. Fabric Blend (67% Modacrylic/29% Cotton/4% Polyester). �7oz. Lining (55% Modacrylic/45% Cotton)Waffle Weave Knit. �2" Flame Resistant Heat Seal Silver Reflective Striping. �Double-Ply Hood with Drawstring Closure. �Rib Knit Cuff and Waistband. �Concealed Smaller Pocket Inside Right Front Pocket �Waffle Knit Lining.